It’s hot out here! Ok, it’s not hot enough for me to complain about it yet, but it’s still pretty toasty with temperatures hovering in the triple digits. 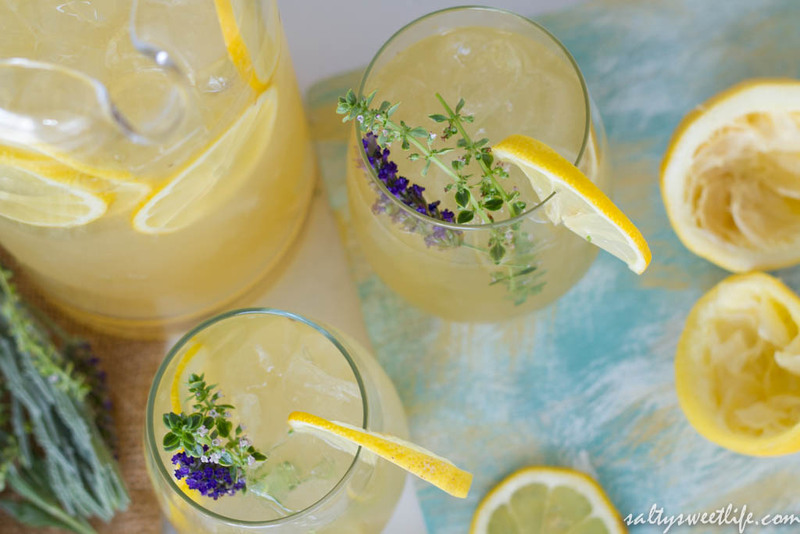 I’ll reserve my complaints for when it’s around 110 degrees in the shade; but for now, I’ll just relax and have something refreshing, like this Lavender Thyme Lemonade Fizz. 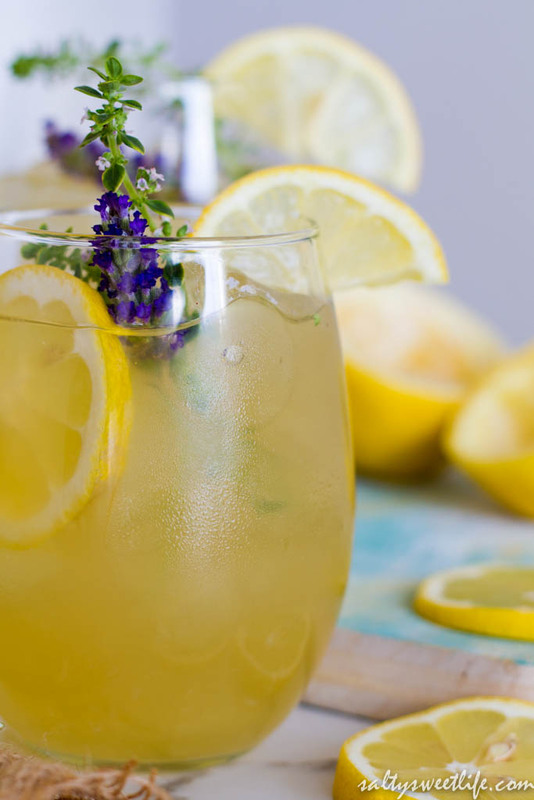 It’s bright and crisp and refreshing, like lemonade always is, but made special with fresh thyme and lavender from the garden! 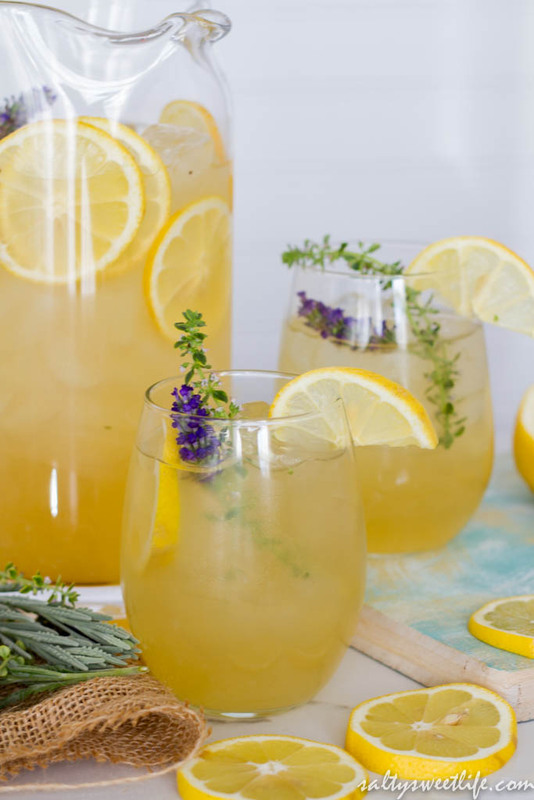 This very grown-up lemonade is a lovely sipper that’s not too strong and perfect for weekends spent in the hot summer sun! Ok, now that you have it in hand, you’ll need about a half of a cup of lavender infused vodka for this recipe. If you like a stronger drink, add additional plain vodka–lavender is a very assertive flavor so a little goes a long way. 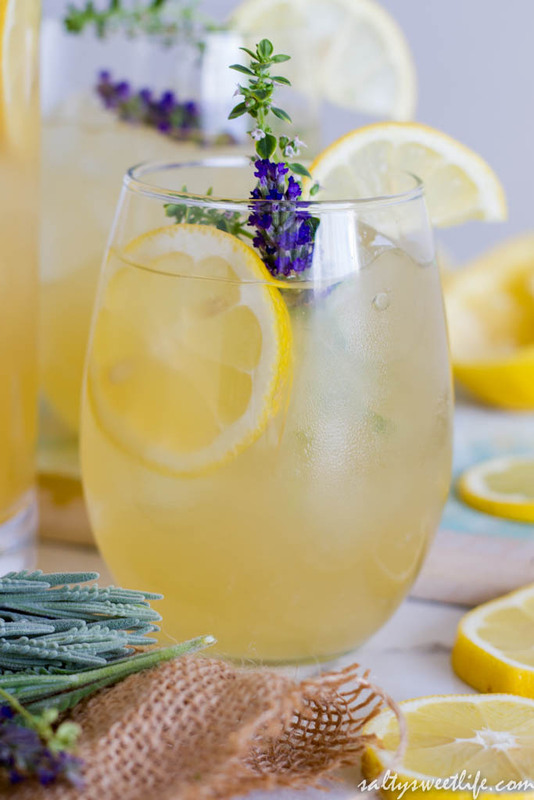 Along with the floral notes of the vodka, the lemonade fizz takes a sophisticated, herbaceous turn with the addition of thyme-infused simple syrup. We discovered that a last minute addition of cocktail bitters perfectly balanced the sweetness of the drink, while the sparkling water just makes it dance on your tongue! Totally refreshing! In a small saucepan, combine the sugar and the water. Heat over medium heat until the sugar completely dissolves. Remove from the heat and add the thyme sprigs. Cover and allow the mixture to steep for 30 minutes. In a 32 ounce pitcher, add the lemon juice, up to one up of the simple syrup (taste it for sweetness), vodka and sparkling water. Add the bitters if using and stir gently to combine. 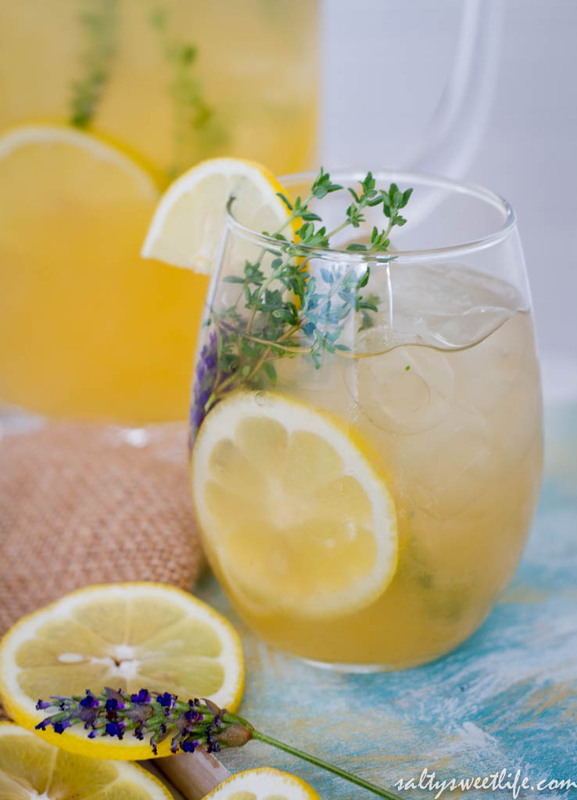 Fill the pitcher with lots of ice and serve immediately over more ice and garnish with more thyme and lavender sprigs. *Note: Now, if by chance you haven’t the opportunity to make your lavender-vanilla infusion yet, all is not lost. 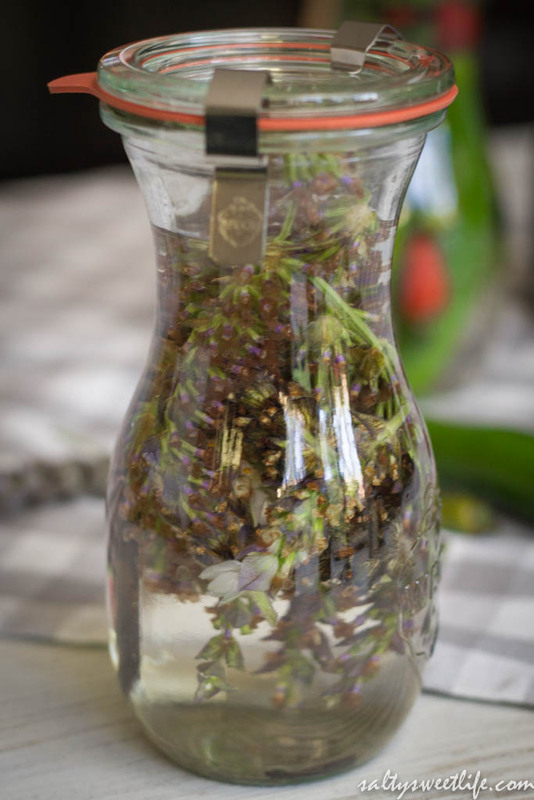 You can easily mix up a batch tonight and your infusion will be ready to use in just a few days or if you want to make this drink immediately, you can simply add a few sprigs of lavender along with the thyme to the simple syrup and use up to one cup of plain vodka. You can also leave out the vodka altogether if you prefer to drink it “virgin”. Thank you!! I am happy to finally have a chance to make something with the infusions! Wow wow wow! Firtst those pictures are beautiful! Second, it looks and sounds soooo good!! Third, I am pinning and will definitely try it out! Thank you so much Melanie! And thank you for pinning! Let me know how it turns out! I’ll be infusing vodka this weekend. Lavender and vanilla, wonderful combination! Thank you! I thought so too! What flavors are you infusing? You toooo!!! Look forward to tour posts and to dig through your old ones later! Thank you for mentioning my recipe! So glad you enjoyed it!